The ants have started their annual ritual of torturing me. It seems that as soon as the spring showers come, the ants show up in my house. This is one of the ways I battle them. 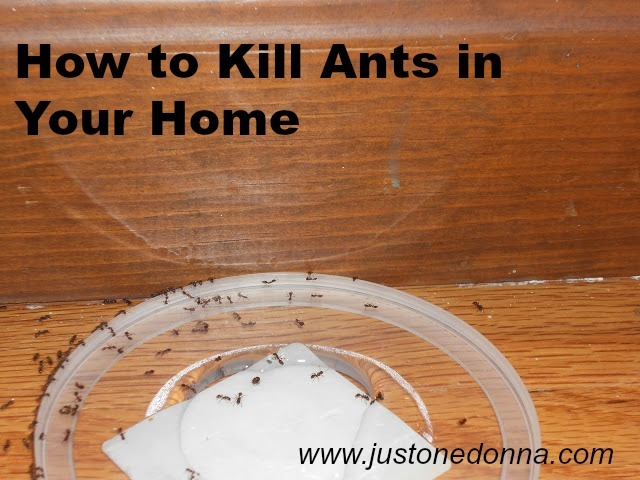 Do you have to do battle with ants in your home? Do you feel as frustrated as I do when facing this yearly ritual? The ants are back. Yes, I'm very unhappy to report that the annual ant battle is underway in my home. I have ants coming out of the woodwork. Literally, ants are coming out of the woodwork! I saw a few little ants gathering around a speck on the floor. When there is one, there are many. Oh no! Let the battle begin! What concerns me most about the battle of the ants is the questionable safety of the arsenal of weapons we have at our disposal. I've used ant sprays, ant traps, and exterminators. None of them have been particularly successful. I am also uncomfortable about frequent applications of insecticides and potential impacts to family members and our dog. Frustrated and at wit's end a few years ago, I searched to find a safer, more effective solution. I found one that worked well for me, so I want to share it with you. I'm using this effective, homemade ant bait. Ant bait works by attracting the worker ants to the bait. The ants feed on it, then carry it back to the colony to feed the growing ants. This effectively eliminates the colony. This works better than just spraying the worker ants with insecticide. That just kills the ants but doesn't kill off the colony. Making homemade ant bait is easy. All you need is borax, sugar, and water. Be sure to follow the directions below and you'll be all set. 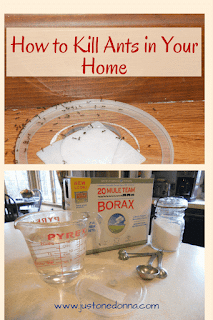 Mix together 2 cups of warm water, ten teaspoons of sugar, and 1 teaspoon of Borax. Stir the mixture until all of the sugar and borax crystals dissolve. You may need to heat the mixture a bit in the microwave to aid the dissolving process, but it really doesn't take very long. Set the mixture aside to cool. You'll also need appropriate containers to hold the liquid bait. I use the lids from plastic deli containers like the one in the picture above. They are very shallow and provide easy access for the ants. I've tried many alternatives but always come back to these shallow, flat lids. The only drawback is that there is no cover to conceal the bait. If you have pets or young children you'll need to be careful that they can't access the bait in these lids. Next, you'll need self-control and patience. Please don't underestimate the importance of both self-control and patience. First, let's address the self-control. What is the first thing you want to do when you see an ant in your home? You want to squash it, don't you? You want to reach for that can of ant spray and kill every ant you see, don't you? Well, this is where the self-control comes in. You really must let them be. The ant bait won't work unless the ants feed on it and take it back to the colony. So, the best thing you can do is take a breath and put out the homemade ant bait. Put it right where you see the ants. You want them to find it quickly and easily. The faster they find the bait, the sooner your ant problem is O-V-E-R! Within an hour of setting out the bait, the ants had begun to find it. See them lining up along the edge of the lid? See how there are more are there than I originally spied on the floor? Remember, where there is one, there are many. Now let's talk about patience. Unfortunately, this ant killing solution takes a bit of time. Depending on the size of your ant problem, you may find yourself refilling your bait trays over and over again. As long as you see the ants coming to your bait you must keep providing a fresh quantity of solution. Yes, friends, this is not a quick fix. In my experience, it could take up to a few weeks before you are confident the ants are gone. In the meantime, you will get satisfaction in seeing the ants coming willingly to the trough. Here's a picture of the morning after I set out the bait. I actually needed to add more bait. Some evaporated overnight, but the ants have sent the word out to all their little ant friends to come to the feeding party. This battle is going very well. I am satisfied... and patient. Be sure to keep your ant bait solution in a well marked, covered container away from pets and children. The solution is very sweet (with ten teaspoons of sugar) so pets and children may find it attractive to sample. I store mine in a well-marked, recycled deli container or a mason jar on a high shelf with my cleaning products. 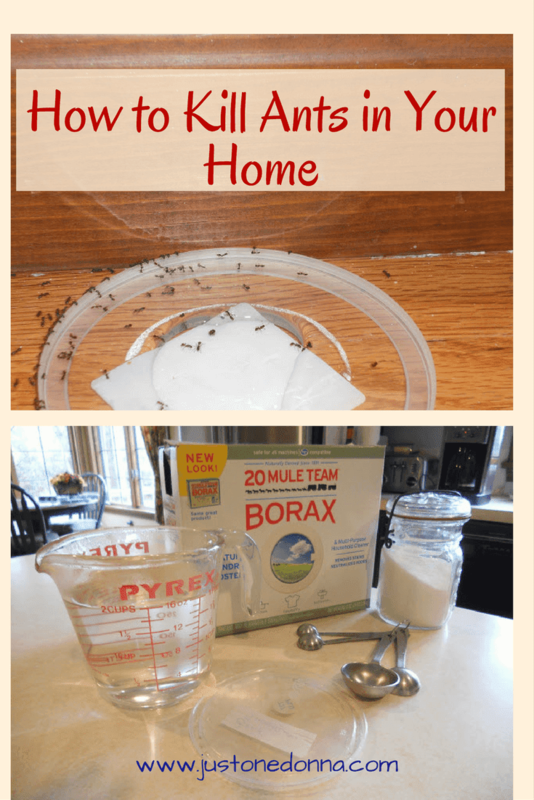 With patience, self-control, borax, sugar, and water you, too, can be ant free. It's a beautiful thing! This is how it looked after two weeks. Two weeks later and all of the ants are gone! This really works. Read how to trap and kill fruit flies. Having trouble with bees? Here's your answer to your bee problem. Thank you for sharing this post.....I am grateful when you share my posts on Facebook, Twitter, and Pinterest!